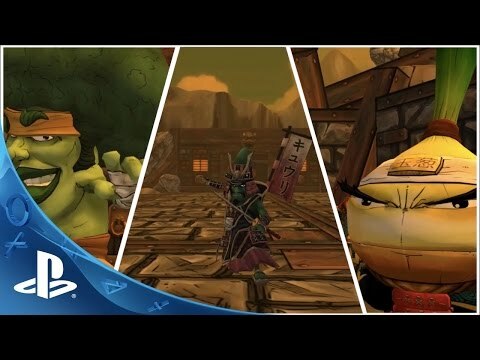 Yasai Ninja presents Kaoru Tamanegi (Samurai Onion) and Broccoli Joe, the protagonists of this new Hack & Slash adventure, where a high dose of action, a combat system designed for one or two players, puzzles, and large amounts of humor abound. Friendship, personal growth, honor and collaborative spirit are mixed in a unique atmosphere. Set in feudal Japan, our vegetables confront multiple enemies, unlock new levels, acquire progressive combat skills, and use their special abilities to solve puzzles. Kaoru Tamanegui (Onion Samurai) has dishonored his master with what he believes to be just cause, but his duty as a samurai leaves him only one way out of his shame. Pondering his situation in the dungeon, he meets Broccoli Joe, a wandering foreign warrior with a jolly character that convinces the desolate samurai that lost honor can be redeemed fighting for noble causes. Together they flee the dungeon, starting down a path that will take them through this land looking for a way to end the tyranny of Shogun Kyurinaga. Bred to serve his master as the perfect warrior, Kaoru became a great Samurai of the Shogun Kyurinaga cucumber. After years of loyal service, Tamanegi discovers the truth of this master's plots. His code of honor prevents him from continuing to serve and leading to a confrontation with the Shogun after which he is declared a traitor and stripped of his honor. When all seems lost he meets the optimistic warrior Broccoli Joe, who convinces Kaoru that honor can be regained if you fight for a good cause. This leads Kaoru to seek revenge against Kyurinaga by any means possible. He needs the help of his allies and a long journey to understand that a true warrior does not fight for vengeance, but for something more, to be at peace with himself. Kaoru Tamanegi is a warrior with little sense of humor and a very dramatic perception of his obligations. He is often taken to his limits of frustration by carefree and chatty Broccoli Joe. Kaoru is very disciplined, sporting a polished style of combat with precise and coordinated moves with his katana. Broccoli Joe is a free-spirited and carefree adventurer traveling aimlessly and carried by the wind. He has a knack for getting into trouble but often gets away with it in a way that even he doesn't understand. After an altercation with the Shogun's soldiers he is imprisoned in the dungeons where he meets Kaoru Tamanegi. There he convinces the devastated samurai to escape without any other intention than to go his own way, but eventually he begins to understand the meaning of friendship and honor, discovering that he can be better and do more for others. His fighting style reflects his anxious personality and carefree fluidity, combined with unpredictability in a self-taught technique of using nunchucks or any part of his body. Yasai ninja"" is an action game that lets you play cooperatively or simply switch between the characters at any time. Each character has his own qualities that are to be combined to advance through the levels. The characters will unlock levels, new moves and life improvements. Platforms: in these side-view zones, the characters have to move quickly to be able to advance, where they must sharpen their reflexes to overcome the obstacles and be precise in their jumps. Exploration: In this type of free-camera environment, the characters face all kinds of enemies and puzzles to be solved cooperatively to achieve their objectives. There are special bosses at these levels that require different game mechanics to be defeated. Yasai Ninja © 2015 Recotechnology S.L. Published by Recotechnology S.L.Developed by Recotechnology S.L. Yasai Ninja and the Yasai Ninja logo are registered trademarks of Recotechnology S.L.